Jagat Jot Sri Guru Granth Sahib jee is written in Larreevaar format means continuous script and the script is called GURMUKHI. In the beginning there is moolmantar form ‘Ik Oankaar’ to ‘Gurparsaad’. Next is the first bani ‘Jap’ which is uttered by Guru Nanak Dev Jee. This bani contains 38 Paurees and 2 Saloks, one in the beginning 'Aad sach Jugaad sach' and second one in end 'Pavan Guru Panni Pita'. This Bani is part of Amrit preparation and morning Nitnem. Next Bani has two parts Sodar and Sopurakh. Sodar has 5 Shabads and in Sopurakh 4. This Bani is also part of Rehraas. Next one is Sohila which has 5 shabad. This Bani is recited before Got to bed. All above Banis are without Raags. Khima for any typo. Bhai Kulbir Singh jio, Bhai Niranjan Singh jio, Bhai Balpreet Singh jio, Bhai Atma Singh jio and many other Singhs please continue with more n more. The most amazing aspect of Guru Granth Sahib jee, in my opinion, is the fact that it is not only spoken but written by the Gurus, whereas other scriptures are not. In 1604AD Sri Guru Arjan Dev jee compiled the first Saroop Sri Guru Granth Sahib jee, the scriber seva was done by scholar Sikh Bhai Gurdass Jee. 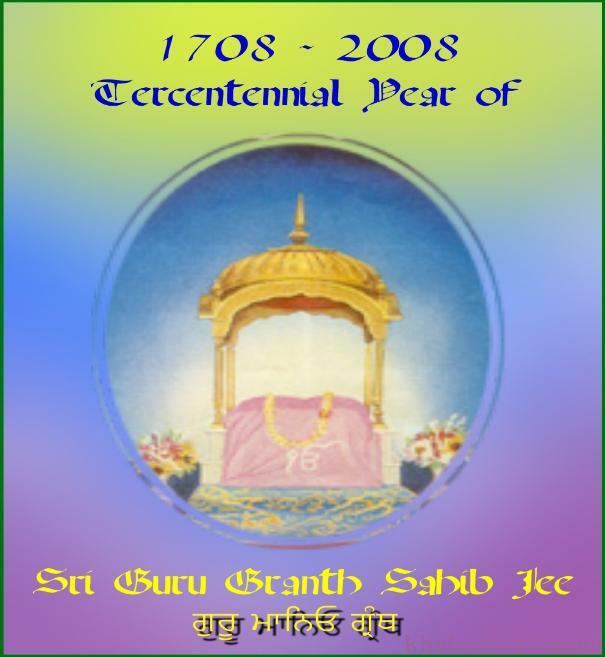 During 1705-1706AD Sri Guru Gobind Singh jee compiled the final Saroop of Sri Guru Granth Sahib jee, the scriber seva was done by scholar Sikh Bhai Mani Singh Jee. Before Joti Jot of Dasam Nanak Sri Guru Gobind Singh Jee, Guru Sahib ordained on 7th October 1708AD to Sikhs GURU MANAIO GRANTH. Total Panna: 1429 but with controversial raagmala 1430. 16 October 1604AD in Sri Harmandir Sahib, Amritsar Sahib. - maharaaj jee's saroop features gurmukhee - a script invented by maharaaj jee himself. as far as i am aware, no other faith features a script which was invented afresh to commit it's 'scriptures' via writing. - maharaaj jee's saroop begins with the numeral ੧. this is the foundation lesson regarding sikhee. 1 god, 1 naam, 1 shabad guroo - these three are 1 and the same. also, it can be interpreted as an affirmation that nirankaar who is nirgun is not some sort of nothingness/nihilism. i.e. vaheguroo is not a void, vaheguroo is not a zero. - according to the thoughts of a UK-based Gursikh,coining the concept of ੧ਓ was maharaaj jee's way of showing the many Hindoo schools of thought that not only is the creator/origin one, ਵਾਹਿਗੁਰੂ is above the 3 primary gods - creator, sustainer, destroyer. via ਓ, by closing the symbol 3 and then continuing the line upwards, guroo sahib shows us that this trinity, central to many schools of Indian spiritual thought, is not at the level of vaheguroo, who is far above. therefore, guroo sahib put an end once and for all to the worship of created gods who themselves have not received maharaaj jee's a(n)mrit and hence darshan. although i am not sure regarding the truth behind this thought, i thought it worth sharing with the sangat. maharaaj jee's saroop. this concept explains why dasmesh pita jee has said that one who worships him will go to hell i.e. one who mistakes his body for jyot/shabad roop (vaheguroo roop), will be guilty of worshipping bvaheguroo's creation. the true worship/contemplation of vaheguroo/guroo, who are one and the same, is worship/contemplation of jyot/shabad (Naam & Banee)...this is the Jyot/Shabad roop which resided within dasmesh pita jee's body and now resides within maharaaj jee's saroop since 1708. gursikhs have worshipped and continue to worship the guroo-jyot in this manner. - let us finish by considering the importane of laRevaar saroop. what more fitting a year than this year to reclaim the true guroo? my limited understanding is that there have never been 2 guroos at any one time. when guroo nanak sahib jee gave guroo-ship to guroo angad sahib jee, uchae avasthaa gursikhs must have realised that the one guroo-jyot was temporarily contained in two human vessels - they saw the same ONE JYOT in two bodies. when guroo nanak sahib jee discarded the human body, then these gursikhs must have realised that the guroo jyot was now, again, only contained in one body. this was a temporary phenomena but note that this was as per vaheguroo's hukam. let us understand that there is and was only ever one guroo-jyot and that guroo jyot resides where siree guroo sahib jee ordains - not where we decide it should. therefore let us accept that guroo jyot resides in laReevaar saroop alone...the only saroop to have guroo-jyot vested by guroo sahib themself. before gursikhs get offended that is not my opinion - it is a fact. for those who think i am disrespecting gurbaaNee by saying this - if we should treat all potheean as 'maharaaj jee's saroop', is it ok to use potheeaa(n) during a(n)mrit sanchaars? no it is not. therefore, we should not use pad-ched beerhaa(n) either. similar to how we as gursikhs respect dasam granth sahib jee, but do not dare to install it on the same level as mahraaj jee, so we should ask ourselves why we do so with pad-ched beeRh. the nihangs did this with dasam granth sahib jee. why cannot the wider panth realise it is guilty of the same rebellious, albeit well-intentioned act, regarding pad-ched beeRh? sikhs should have complete faith in dasmesh pita jee's hukam and not the hukams of those who would intentionally/un-intentionally conceal maharaaj jee's true saroop i.e. printers, panthic dushsts, misinformed sikhs and well-intentioned premee gursikhs who have their understanding as per vaheguroo's hukam/bhana. the first and second are the worst thieves, bemukhs and panthic enemies. the third simply lack education which can be rectified and the latter we should humbly do veechar with, drenched in love, respect and pyaar...never arguing but simply fulfilling maharaaj jee's hukam by ensuring the True Guroo is never concealed. those gursikhs who have had maharaaj jee's darshan through pad-ched beeRh should use their bibek budhee to understand that this is maharaaj jee's greatness and compassion - not 'proof' that maharaaj jee's jyot is also contained in pad-ched beeRh. maharaaj jee rewards gursikhs according to only how he himself is aware...we cannot 'measure' or 'rationalise' this and certainly shouldn't use such arguments to argue against the supremacy of laReevaar saroop. furthermore, maharaaj jee has given partakh darshan to gursikhs while they have been in bedrooms, jungles, fields etc. that does not mean that guroo-jyot has been vested into those places. also, in another sense, guroo sahib resides everywhere amongst the created universe as a matter of course. Those who conceal and deny their Guru, are the most evil people. O Dear Lord, let me not even see them; they are the worst sinners and murderers. O chosen people, O self-elect, one who does not publicly affirm his Guru is not a good person; he loses all his profits and capital. i do a bentee to those gursikhs who feel that pro-laReevaar proponents, such as this guroo-ka-daas, are disrespecting maharaaj jee by speaking against pad-ched beeRh to at least consider the above pankteeaa(n). also please realise the following: such people as myself say what we say out of a deep-set acceptance/love/fear regarding maharaaj jee's ultimate hukam....his self-ordained Shabad-Jyot Saroop - Siree Guroo Granth Sahib Jee. may gursikhs the world over gain maharaaj jee's khushee by humbly, yet passionately, promoting laReevaar saroop this year of all years. in another 300 years time, may we only have darshan of maharaaj jee's laReevaar saroop on planet earth...the way mahraaj jee had always intended. Those who turn their back towards 'Granth Sahib Jee' while in It's presence/while sitting will be punished. If the listener sits in a higher position than the reciter [of GurbaaNee], he will be punished for showing disrespect. The Sikh of the Guru should wash their body, face and hands before sitting at the 'Granth Jee' to read GurbaaNee. Guru Gobind Singh jee was about to mount his horse, he suddenly asked the Khalsa that was standing around to recite Guru Granth Sahib jee in the time it took him to get on the horse. IMPOSSIBLE! thought the sangat, except for one Singh who did as Guru Sahib ordered, he got as far as saying 'Ik Oankar Sat.. , Guru Gobind Singh jee sat on his horse and finished off by saying 'Gurprasad'. Guru Sahib explained the whole fundamental message of Guru Granth Sahib jee is : There is One God - realised by the Grace of the True Guru. Dont get mislead by anyone who says they are Guru Nanak Dev jee, nor by anyone who claims to be a living human SatGuru, nor anyone who says for 20GBP they'll tell you your future from some cards. Believe in True Guru Granth Sahib jee and no one else. Say to Guru Granth Sahib jee, ' You are my master, highest, unparralled and most gracious, you look after all that sing Gods praises and all those that listen to Gods praises, save me as well Baba jee'. Guru Granth Sahib jee is 'Jag dee Jot' the Light of the World. Believe this whole heartedly without doubt, Guru Gobind Singh jee says 'Sabh Sikhan ko Hukam ha, Guru Mani-o Granth' 'It is the order to all Sikhs to believe their Guru is the Granth '. There's a Sakhi about belief: Bhai Bala jee asked Guru Angad Dev jee how come he became the second Guru after doing only a few years of seva, whereas Bhai Bala jee had dedicated most of his life to guru Nanak jee? Guru Angad Dev jee said to him, 'Bhai Bala jee what did you see Guru Nanak jee as? ', Bhai Bala jee said 'He was a perfect Sant in this world'. Guru Anagad Dev jee said, 'And you too have become a perfect Sant in this world'. Bhai Bala asked Guru Angad Dev jee what he saw, Guru Angad Dev jee said,' I saw Waheguru jee himself in Guru Nanak jee and I was made Guru'. In the same way, treat Guru Granth Sahib jee as the embodoiment of Waheguru jees light - perfect and pure in every way, believe in no other man or photo then your love will take you to the Supreme light where you are destined to merge in anand and happiness. If one believes Guru Granth Sahib jee is merely ink and paper, but a man is necessary to bow to and worship then that person is destined to be second best like Bhai Bala jee. - keep singing this until you truly understand it. To keep the Gurbani spirit high we would like to introduce this quiz. Following two shabads are very similar but there are number of diffrences in between them. We request to each and every Sikh to participate in this quiz and let's see who can find the more differences. Read and write in serial for example common thing in between them is we read them every day but when?, any difference you can think of. Just to start there are 50+ differences. Brain storm and enjoy. Satbachan jio, we thought about that before but finally chose those 2 as first step and also because they are in every Sikh's daily routine. Once sangat agreed on max number of differences for these two we can include 3rd one too.